Last year, the firm launched its pilot urban farming venture - with the help of four A900 Rocket Composters from Tidy Planet - which sees the city's disused underground car parks used as composting sites. Due to the project's resounding success, Les Alchimistes has received support from the French Government and EU funding to launch its latest and biggest waste-to-resource project, in city-centre Paris. The Lil'O composting Project is located on an island in the River Seine - known locally as L'Île-Saint-Denis - 10km north of the Eiffel Tower. It was previously used for the storage of building materials and municipal vehicles and is set to be regenerated as a composting nucleus, now that it's home to a newly installed B1400 machine. Les Alchimistes needed equipment that would process up to two tonnes of a mix of food and shredded wood wastes every day - in line with the site's waste processing threshold - and this was the catalyst for the commissioning of the B1400. Commenting on the collaboration, James Tyler, director at Tidy Planet, said: "It's amazing to be part of this sustainable and innovative venture. When designing the B1400, there was a lot to take into consideration. It had to be ‘portable', so it could be easily transported by road, whilst also adhering to the French Government's legislative waste-processing parameters - it's a great addition to our current Composter range." A smaller version of its sister unit, the B2500, the B1400 Rocket Composter is a twin-shaft composting system, that allows the company to maximise its ability to collect more food waste, with minimal handling and space requirements. A distinctive feature of the machine is the new GSM and internet-linked control package, which allows the manufacturers and operators to log performance, plus monitor and adjust the running parameters from anywhere in the world. Alexandre Guilluy, Les Alchimistes co-founder and president, said: "We're deeply committed to harnessing food waste as a valuable resource and reinventing traditional waste management. Our composting and growing projects throughout Paris aren't just environmentally-friendly though, they are also socially-inclusive. "The team carries out the entire biowaste-to-compost process, right through from the pedal-powered collection, to the seed growing and composting." 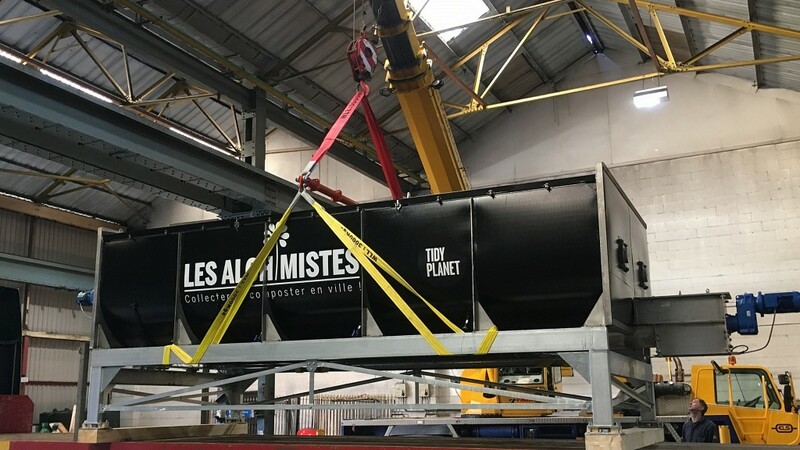 With a huge focus on sustainable waste management and innovative solutions, Les Alchimistes is leading the way in greener and more environmentally-friendly solutions to other disposal alternatives such as landfill. More B1400 projects are set to be introduced across the rest of France over the coming year, and an A900 model is soon to be shipped for another of the organisation's composting and commercial food waste collection projects in Lyon. According to Tidy Planet, France is a country which has been spearheading international food waste management agenda for the past few years. Back in 2016, it was the world's first country to ban supermarket waste - implementing fines for stores that do not donate unsold foods to charities and food banks. In the late 1980s Vancouver-based Recycling Alternative founder Louise Schwarz was driven by the ambition to help change the culture surrounding waste management and advance the transition away from a "throw-away" society. She still is. She began by collecting office paper from local businesses in a hatchback car, and co-founder Robert Weatherbe soon joined as a partner. Composting facilities in Texas and Tennessee, a non-profit program in San Diego, California, and an energetic organics program in Minneapolis, were among those who were honoured by their peers by the US Composting Council at a January ceremony. Awardees are nominated and honoured each year at the US Composting Council's (USCC) Annual Conference and Tradeshow. This year's program was held at the Renaissance Hotel, Glendale, Arizona, from January 28-31. Compost contains a multitude of essential nutrients for plant growth, such as nitrogen (N), phosphorus (P) and potassium (K), and can also be a source of organic matter. However, recent concerns and criticisms have been directed toward composts with a high concentration of soluble salts. Soluble salts refer to the amount of soluble ions, such as calcium (Ca2+), potassium (K+), magnesium (Mg2+) and sodium (Na+), present in compost. Soluble salts are measured indirectly and cumulatively through electrical conductivity (EC). BioHiTech Global, Inc., a technology and services company that provides cost-effective and sustainable waste management solutions, has announced the results of an independent Life Cycle Assessment (LCA) of its aerobic digester solution for food waste conducted by the Department of Civil and Environmental Engineering at the University of Delaware. Electrolux announced recently that it is investing in Sweden-based Karma, a leading startup that helps restaurants and supermarkets reduce food waste by selling unsold food to consumers. The investment is part of a wider USD 12 million round with other investors. Electrolux and Karma are also initiating a strategic partnership to explore common solutions in reducing food waste. A&W Canada has celebrated World Oceans Day 2018 by announcing it will remove plastic straws from its restaurants and instead offer its customers paper straws by the end of the year. Morbark, LLC, a leading manufacturer of forestry, biomass, tree care, sawmill, and wood recycling equipment, recently debuted two new machines: the 6400XT Wood Hog Horizontal Grinder and the 50/48X Whole Tree Drum Chipper. At the start of Spring, the work of the organic recycling industry goes into hyper-action. Ongoing processing provides the basis for critical emphasis on sales and availability of compost for a variety of purposes and end markets. May 6-12 is International Compost Awareness Week. May 6 - 12, 2018 is International Compost Awareness Week (ICAW), the largest and most comprehensive education initiative of the compost industry. It is celebrated in Canada, the U.S. and in other countries each year during the first full week of May. Started in Canada in 1995, ICAW has continued to grow as more people, businesses, municipalities, schools and organizations are recognizing the importance of composting and the long-term benefits from organics recycling. Power Knot is debuting the company's fifth-generation LFC-V Liquid Food Composter that converts solid food waste into drain-safe wastewater through bio-digestion, at WasteExpo 2018, Booth 1245, in Las Vegas, April 23-26. Also being unveiled is Power Knot's SBT Bin Tipper that lifts and tips all popular waste skips and bins into the new composter. Hop Compost built their first composting operation in Calgary in 2015. According to Kevin Davies, founder and CEO, due to their location in the city, at 17A Street, theirs is currently the most inner-city compost facility in Canada. The Commission for Environmental Cooperation (CEC), out of Montreal, has released a comprehensive report on the state of food loss and waste in Canada, Mexico and the United States, developed through the CEC's North American Initiative on Food Waste Reduction and Recovery. Characterization and Management of Food Loss and Waste in North America documents adverse socio-economic and environmental impacts of food loss and waste, and actions that the industrial, commercial, institutional, government and nongovernmental sectors can implement to mitigate these impacts. David Donaldson, Head of the Green Growth Unit at the Commission for Environmental Cooperation (CEC) is one of the authors behind a recently released report outlining solutions to North America's organic waste issue. Recent statistics show that Canada, Mexico and the United States generate nearly 265 million tonnes of organic waste every year, with less than 75 million diverted through composting and anaerobic digestion, and approximately 190 million tonnes ending up in landfills. Nine locations of The Bobcat of St. Louis dealer network across Missouri, Indiana, Illinois, Kentucky and Tennessee have joined Bandit Industries' growing network of authorized dealers, increasing the reach of Bandit to offer the company's line of Beast Horizontal Grinders and other equipment to hardworking professionals involved in wood and organic waste recycling and processing. Rotochopper owners and operators gathered at Rotochopper's manufacturing facility in St. Martin, MN for training during the last two weeks of February. The customer service department hosts Rotochopper University annually for companies that have purchased Rotochopper grinders the past year. A new report issued by the Solid Waste Association of North America's (SWANA) Applied Research Foundation (ARF) presents valuable lessons that can be learned from the implementation and operation of Mechanical Biological Treatment (MBT) facilities in Europe. Alberta-based company Tyalta Industries Inc., has been in the aggregate equipment industry for 22+ years and wanted to complement their aggregate product line with a high-quality manufacture of organic processing equipment. They recently partnered with Komptech Americas to offer screens, shredders, windrow turners and separation technology in Alberta, Saskatchewan, Manitoba and Northwest Territories. Bandit Industries has added an additional option to The Beast horizontal grinder lineup by introducing the Model 2460XP. Available as a towable or track machine, the Model 2460XP is a machine built from the ground up, and is designed to outperform every other horizontal grinder in its class. CBI and Terex Ecotec will be demonstrating equipment live at the United States Composting Council's annual equipment show on January 25th in Ellenwood, Georgia. CBI is running the 6800BT Horizontal Grinder and 5800BT Horizontal Grinder. Ecotec is demonstrating a TDS 820 Slow Speed Shredder, a Phoenix 2100 Trommel Screen, and a TWT 500 Windrow Turner. Sulzer has announced that it has completed the acquisition of JWC Environmental, LLC. JWC is a leading provider of highly engineered, mission-critical solids reduction and removal products including grinders, screens, and dissolved air flotation systems for municipal, industrial and commercial wastewater applications, as well as for applications in solid waste management. BossTek has introduced the newest model in its growing family of self-powered dust suppression equipment, as BossTek announces the debut of the DustBoss DB-30 Fusion. The new design is a versatile and transportable atomized mist unit, engineered with a workhorse electric motor and 30 KW generator. Permanently mounted on a rugged road-worthy trailer, the company's Fusion lineup is proving to be a popular and effective means of delivering powerful dust suppression technology to sites that lack a convenient power source. The Targo 3000 is a new, universal single-shaft shredder designed and built in Germany by Neuenhauser, and will be on display at the Waste Exp in Las Vegas Apil 24th - 26th. Expanding the company product line from star and trommel screens into the slow-speed shredder market, the Targo 3000 unit features a 535 HP John Deere Tier IV engine with a 3-meter long shredder shaft that rotates at 31 rpm and is equipped with either 21 or 42 bolt on teeth. This machine is available as a wheel or track unit, and the different tooth configurations and an adjustable hydraulic comb mean it can be set up to process a variety of products including C&D, stumps, green waste, domestic and industrial waste.